There are millions of children around the world who need a pair of crutches to walk due to disease, trauma or poor healthcare. They struggle to walk, go to school, play with their friends, and lead a productive life. While crutches are rare and valuable commodities in many parts of the world, there are millions of crutches across America sitting unused in closets, garages, and attics. 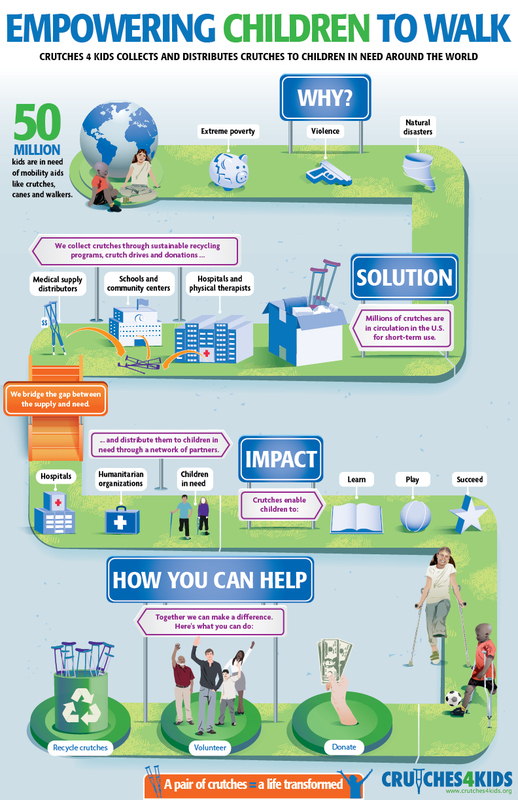 Crutches 4 Kids’ mission is simple and high impact – to help children move. Our efforts are giving the gift of mobility to children, and thus fostering greater independence, hope, and dignity. Crutches 4 Kids bridges the gap between the abundant supply of crutches in the United States and the staggering demand elsewhere in the world.